Folic acid is most commonly known as Vitamin B9 and it needed most before and during pregnancy. Besides being needed most during pregnancy, folic acid is also known to help with cataracts, low cholesterol, hardening of the arteries and depression. Folic acid is most commonly known as Vitamin B9 and it needed most before and during pregnancy. 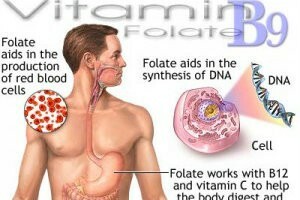 Folic acid is needed for the formation of healthy red blood cells especially while the fetus is forming. When there is a lack of this vitamin, there is a possibility of deficiency where the spinal column does not close properly or little formation of brain tissue. Besides birth defects, folic acid is also known to help with cataracts, low cholesterol, hardening of the arteries and depression. Foods that are natural sources of vitamin B9 are brewer’s yeast, lentils, dry beans, barley, brown rice, salmon, tuna, mushrooms, broccoli, asparagus, spinach, split peas, toasted wheat germ, most berries, cereal grains, romaine lettuce, Brussel sprouts, peas, peanuts, beets, avocados and citrus fruit. Many of the listed foods are easy to incorporate into your dog’s diet but may take some masking to get your feline friend to eat it. It is best to puree the fruits and vegetables prior to adding them into your pet's diet for the highest nutrition absorption. Deficiencies of the B vitamins can be common mostly due to their fragile state during processing and storage. Therefore, it may be necessary to use a high-quality multivitamin to make sure your cat and dog is receiving its daily essential dose since most of our pet food is not freshly served. It is not uncommon to use a B-complex vitamin to get all B vitamins in the right components. Vitamin B9 often works in conjunction with Vitamin B12. You can use a human B-complex supplement for animals but should be used accordingly to their size. There are some great multi-vitamins for pets on the market such as Animal Essentials Multi-Vitamin, I Love Dogs Multi-Vitamin and O’Paws Fundamental Vitality that are both cat and dog-friendly. If you plan on breeding your cat or dog, I would suggest a multi-vitamin before and during the pregnancy to make sure they have the necessary vitamins. If you are feeding a low meat or vegetarian diet then it is especially important to consider a multi-vitamin that contains B vitamins to minimize any nutrition deficiencies. Does your pet get enough Folic Acid?